A study was conducted by Reddy VY, Miller MA, Neuzil P, et al to evaluate safety and efficacy of wireless left ventricular (LV) pacing to achieve cardiac resynchronization therapy (CRT). Although a CRT system can be implanted in about 90% of patients with CHF and bundle branch block, about 30-40% fail to respond to resynchronization therapy. This preliminary study showed that a wireless LV pacing system can be successfully implanted in most patients and results in objective and clinical improvement in this challenging set of patients. The system has undergone modification to minimize the risk of perforation (none in the current study), and further refinements will help reduce the incidence of transmitter failure. Larger studies are needed to assess the safety and efficacy of this promising technology. In the study Patients (n = 35) with congestive heart failure (CHF) who had not responded to or were not candidates for conventional biventricular pacing underwent implantation of a wireless-CRT system. The system consists of an endocardial pacing electrode (volume = 0.05 cc; implanted via a retrograde aortic approach), acoustic transmitter, and battery (implanted separately, subcutaneously over the left chest wall), along with a conventional transvenous pacemaker/defibrillator for right ventricular (RV) pacing. Electrodes located on the external surface of the transmitter and battery are capable of sensing the RV pacing stimulus, which then triggers an ultrasound pulse. The ultrasonic energy is converted to electrical energy by the electrode, resulting in LV capture. The Authors found that the wireless CRT system was successfully implanted in 34 patients (97%). Bi-ventricular pacing was achieved in 33/34 patients at 1 month. An improvement in the clinical composite score was noted in 28/33 (85%) patients. At 6 months, there was improvement in ejection fraction (26-33%) and LV volumes. There was also a significant reduction of the intrinsic QRS duration (170-143 ms). One patient developed ventricular fibrillation during introduction of the delivery system into the LV resulting in prolonged resuscitation, and ultimately death 4 days later. There was also a case of electrode embolization to the peripheral vasculature that was treated conservatively. A patient with atrial fibrillation and sub-therapeutic anti-coagulation suffered a stroke. In three other patients, the procedure was not performed due to poor acoustic windows. The Authors concluded that this novel wireless CRT system can be implanted safely and seems to result in clinical benefit in CHF patients who did not respond to or were not candidates for a conventional approach to bi-ventricular pacing. 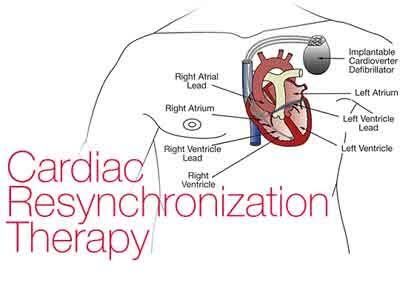 Cardiac Resynchronization Therapy With Wireless Left Ventricular Endocardial Pacing: The SELECT-LV Study. J Am Coll Cardiol 2017;69:2119-2129.